I use British crochet terms. For American terms, substitute tr with dc and dc with sc. Row 1: I tr in 4th chain from hook. I tr into each ch across. Turn. Row 2: Ch 3. 1 tr into first tr. [2 tr into next tr, tr into next tr] repeat until end. Rows 3 – 6: Repeat row 2. Join in yarn to first chain of foundation chain. Ch 1 and dc into each ch across. 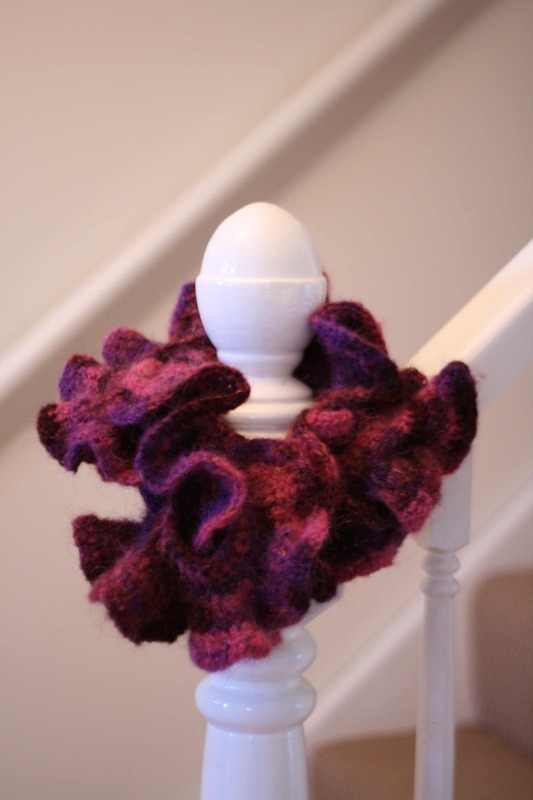 This scarf is lovely–thank you for sharing the pattern! I made your cascading scarf for a friends birthday and it turned out really nice! I’m thinking of making this one for another friends birthday coming up in a few days. Thanks for these free patterns! This ruffle scarf is simply chic. I’m an Editor for FaveCrafts.com and took the liberty of linking to your blog from my round-up post on 22 Free Holiday Crochet Patterns. I also made your cascade scarf & had so many complinents on it by family & friends! I am now going to start making this one right now! I love your easy to read patterns & style! Keep up the great work! I also want to thank you for the pattern. I wanted to mention that I adapted it a bit because I am not very tall so I only started with chain 100 and it worked perfectly. I also made just 5 rows instead of 6 to better suite my body size. Looks great! Thanks!